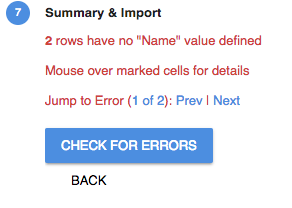 Why do I get errors when importing with Google Sheets? Free From Columns - these columns are perfect for import! For example, if you will be importing the Deal Size, for example, you will want to add a 'Free Form Column' to your Pipeline. Date Columns - Date columns can be imported into, but must be formatted as a date in your import file. Checkbox Columns - Checkbox columns can be imported into with values of either 'Checked' or 'Unchecked'. Dropdown and Tag Columns - these columns can be imported into, but values in your import file that do not have matching options in the Pipeline will not be imported unless otherwise indicated in the 'Advanced Options' step of the import process (select the option to 'Create missing field options'). Assigned To - users who are shared on the Pipeline can be added to the Assigned To filed for import, but must be listed by their email address. Magic Columns - these columns are automatically calculated from your Box content and cannot be imported into. Formula Columns - these columns can only be edited in the pipeline and cannot be imported into. Linked Boxes - these columns are populated when Boxes are linked at the Box level and cannot be imported into.